A talk by Pete Codella for high council speaking Sunday in November 2016 (learn more here). I was born when my parents were just 22 years old. I’m the oldest of three siblings and have a sister three years younger than me and a brother six years younger. I enjoyed the typical American suburban upbringing, in Logan, Utah until I was seven, Spring, Texas until I was 13, and Niskayuna, New York before heading off to BYU as a know-it-all 18 year-old on a vocal talent scholarship. My parents met in Cedar City and were married by a Mormon bishop in my mom’s family’s home in Richfield, Utah. 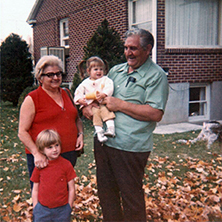 My dad, a second-generation American, came from an Italian Catholic family. As a young teenager, he moved with his family from New Jersey to Nevada, which put him in proximity to go to college in Cedar City — close enough to drive home when he really needed to, but far enough to be away from home. From what I’ve been told, the Codella family wasn’t super fond of my parents’ marriage and didn’t condone my dad joining the LDS Church, which he did shortly after my folks were married in 1968. I’m happy to report though, that once I came along with my chubby, pinchable cheeks and unruly hair, my grandparents warmed up to their first grandchild and our family. By the time I was riding a tricycle, we enjoyed visiting with and welcoming my grandparents to our home at least each year. The answer is, my topic today is that of family, and I couldn’t think of a better way to introduce the subject than to share a little about my beginnings on this planet, in a family with a husband and wife sealed together through the power of the Lord’s priesthood in His holy temple. The text for my assigned talk is predominantly The Family: A Proclamation to the World. But I’m taking some creative liberties and giving my talk the title of: The Noble, Royal Family. And by the way, a little internet tidbit for you: Do you know what the first Google search result is for ‘Jesus Christ?’ It’s Mormon.org. Now, back to the family. I want us to think about our premortal family and heritage, about our noble birthright, and about our loving heavenly parents who prepared the perfect plan of happiness and plan of salvation, which included providing a temporal existence and experience for us, their spirit children. We are part of an eternal royal family. I’d also like you to consider the family from a pre-21st Century perspective. What was the nature and structure of the human family from the days of Adam and Eve until the technological advances of our modern era? The family on earth first existed when God married Adam and Eve. Then, as the scriptures say, Adam knew Eve, she conceived and had a son they named Cain. The natural, God-ordained family, thus began and has continued to exist here on earth. Of course natural laws mean not only birth, but also death. For centuries families have dealt and struggled with the loss of loved ones, which, over time, takes away parts of the living family tree. There’s a modern movement to redefine the family, to take away its God-given establishment and, with phrases like ‘until death do us part,’ to limit marital relationships. Satan’s whole shtick is all about what’s counterfeit to God’s plan: a savior for those who wouldn’t need saving because they’d be forced to live and behave in specific ways, a philosophy of “Eat, drink, and be merry, for tomorrow we die; and it shall be well with us” (2 Nephi 28:7), and the pervasive attitude of defining marriage solely for love’s sake outside of any moral God-given parameters. Not to mention the many social science and socioeconomic reasons supporting marriage first, then children. Getting married before having children is a strong indicator of future financial success. During the 20th Century, the First Presidency and Quorum of the Twelve have issued only two proclamations: the 1995 proclamation on the family and the 1980 proclamation issued during the sesquicentennial anniversary of the restoration of the Church. According to the Encyclopedia of Mormonism, all Church declarations since the restoration of the gospel “have been solemn and sacred in nature and were issued with the intent to bring forth, build up, and regulate the affairs of the Church as the kingdom of God on the earth. Subject matter has included instruction on doctrine, faith, and history; warnings of judgments to come; invitations to assist in the work; and statements of Church growth and progress” (3:1151). Generally, declarations and statements are directed at Church membership, whereas proclamations are meant to reach beyond the scope of Church membership. “The Family: A Proclamation to the World” emphasizes the importance our Heavenly Father places on the family and is a declaration and reaffirmation of doctrines and practices that prophets have stated repeatedly throughout the history of the Church. It contains principles that are vital to the happiness and well-being of every family. Family members should study, ponder and pray about the proclamation and live by its precepts. I’d like to point out three things about the proclamation: First, as its title suggests, the subject is the family. Second, the audience is the whole world, planet earth. And third, those proclaiming it are called and sustained as prophets, seers and revelators. This means that the family, and the preservation of it, must be of tremendous importance, that whatever the proclamation says could help anyone in the world, and that the proclamation fits the Lord’s promise when he said that “Whether by mine own voice or by the voice of my servants, it is the same” (D&C 1:38). We know that “the family is central to the Creator’s plan for the eternal destiny of His children.” So we should expect that Satan would work to counterfeit the family and undermine Heavenly Father’s plan. We also know that “gender is an essential characteristic of individual premortal, mortal, and eternal identity and purpose.” In our day, there are many misguided attempts to minimize and confuse gender — ideas and procedures that weren’t readily available or acceptable even in 1995 when the proclamation was given. …the setting for our physical birth and subsequent spiritual rebirth into the kingdom of God. For His work to succeed to “[exalt us] with himself,” God ordained that men and women should marry and give birth to children, thereby creating, in partnership with God, the physical bodies that are key to the test of mortality and essential to eternal glory with Him. He also ordained that parents should establish families and rear their children in light and truth, leading them to a hope in Christ. Knowing why we left the presence of our Heavenly Father and what it takes to return and be exalted with Him, it becomes very clear that nothing relative to our time on earth can be more important than physical birth and spiritual rebirth, the two prerequisites of eternal life. This is, to use the words of Dietrich Bonhoeffer, the “office” of marriage, the “post of responsibility towards … mankind,” that this divine institution “from above, from God” occupies. It is the “link in the chain of the generations” both here and hereafter — the order of heaven. I believe marriage between a man and a woman does something else intended for our sojourn here: It pairs us up with a complementary person, it teaches us to be selfless and helps us understand what it means to be one. Similar to Jesus’ prayer: “That they all may be one; as thou, Father, art in me, and I in thee, that they also may be one in us” (John 17:21), marriage and family help us understand what it means to work together towards a common goal, with a common purpose. We learn about sacrifice, and just about every defining characteristic of mortality, in a family setting. Men and women naturally complement each other, physically, emotionally and spiritually. Families teach us so many important lessons. A difficult lesson Vickey and I have learned in our marriage is how quickly a family could be taken away. When Dominic was almost two-and-a-half, he tripped and fell while running in our house and suffered a spiral fracture of his left femur. I took him to the ER expecting to get a cast put on his leg and be home a few hours later. But because of the nature of the break, the next thing I knew there were police officers and detectives and workers from child protective services surrounding the hospital bed asking me questions, requesting head-to-toe x-rays of Dominic and asking for Vickey to come to the hospital and for both of us to provide recorded testimony of what happened and possibly take lie detector tests. An officer also interviewed Ellie, who was in first grade, to get her take on what happened. Dominic was admitted to the hospital that night, in intensive care where they could keep us under surveillance for three days. For several months, people from the state would drop by our home to check-up on us. Finally a nurse told us that she could tell from being in our home that we weren’t abusive parents. All of this seemed to happen in a bubble, with no effort to reach out to those who knew us for character witnesses. We learned when we complained to the police about Ellie’s interrogation — alone at the elementary school in a room with no windows, with a male officer — that we had very few rights as parents and our children could very easily be taken into state custody. A secondary experience for me was what it felt like, as Dominic’s father, to sit alone by his hospital bed, next to a toddler who couldn’t talk to express himself, who looked at me with big tear-filled eyes in tremendous pain, and to have the Spirit teach me a small portion of what the experience must have been like for the prophet of the restoration and his father, at the time of Joseph’s leg operation. And in a very small, minute way, a little about how the culminating experience of the atonement of Jesus Christ must have felt to our Heavenly Father and His Only Begotten Son. Family relationships are tender. They’re deep. They’re profound. And what we do and say as family members here will have eternal consequences. The family unit is fundamental not only to society and to the Church but also to our hope for eternal life. We begin to practice in the family, the smaller unit, what will spread to the Church and to the society in which we live in this world, which will then be what we practice in families bound together forever by covenants and by faithfulness. The proclamation states: “We declare the means by which mortal life is created to be divinely appointed. We affirm the sanctity of life and of its importance in God’s eternal plan. There are three principles taught in the proclamation which I think are especially in need of steadfast defenders. The first is marriage between a man and a woman. … The next principle which calls for our defending voices is elevating the divine roles of mothers and fathers. … The last principle we need to stand and defend is the sanctity of the home. My family may tell you that I focus too much on the ‘organize’ and ‘order’ parts of this scripture. Sometimes I have to sequester myself to our master suite to find peace and enjoy quiet, uncluttered zen moments. I suppose we all have our shortcomings. Now, back to the proclamation: “Happiness in family life is most likely to be achieved when founded upon the teachings of the Lord Jesus Christ. Successful marriages and families are established and maintained on principles of faith, prayer, repentance, forgiveness, respect, love, compassion, work, and wholesome recreational activities. I think it’s important to note here that we’re not all given the opportunity to be part of a traditional family. No family is perfect. Whether we think of our families as complete or something else entirely, we know the Lord has purposefully placed us where we are and that there are important lessons to be learned and characteristics to be developed in each of our lives on our journey back to our noble, royal family. The prophets and apostles conclude the proclamation with this: “We warn that individuals who violate covenants of chastity, who abuse spouse or offspring, or who fail to fulfill family responsibilities will one day stand accountable before God. Further, we warn that the disintegration of the family will bring upon individuals, communities, and nations the calamities foretold by ancient and modern prophets. Perhaps, as a result of these few minutes we’ve spent together, each of us can commit to read, study and ponder the message of The Family: A Proclamation to the World. We can share our personal thoughts and observations in a family home evening, a journal entry or online. Additionally, perhaps we can find the strength, courage and integrity to treat those who know us best better than those who know us least. We spend so much time away from home and sometimes have a tendency to treat strangers better than we treat members of our own family. Perhaps we can look through glasses of forgiveness to finally forgive and forget, and stop bringing up, mistakes that our loved ones have made. Sometimes it’s better to give people the benefit of the doubt and move forward with faith in a bright future. If there’s one constant throughout our continually changing mortal experience, it’s family. We need to invest time and resources to strengthen, fortify and uplift our families, and to speak publicly about the importance of, and our support for, the family. Ultimately, we need to endow each family member with a knowledge of, love and appreciation for, our Savior, Jesus Christ and His atonement and all that he has made possible for us to receive and benefit from, even eternal life and exaltation in the celestial kingdom of our Heavenly Father. I love my family, both extended and immediate. I’m incredibly blessed by my eternal companion and will be the first to tell you that I’m the most fortunate guy in the world. Let’s defend and protect the eternal truths contained in the family proclamation in all that we think, say and do.